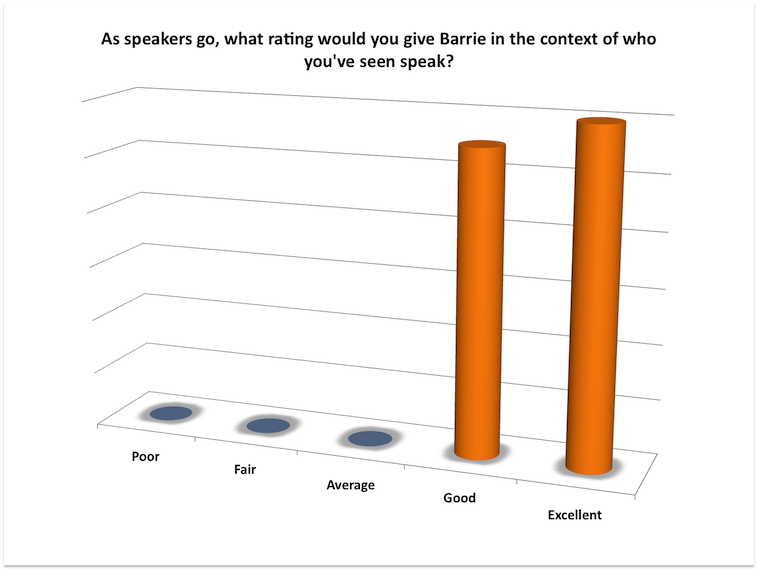 IS BARRIE A TOP 10 CONFERENCE SPEAKER? Asking for feedback from clients about what you do well and not so well is important for any business. It’s a little more difficult to do when you personally are the business you’re asking people to rate. However, if you want to improve as a Conference Keynote Speaker there’s no better way than hearing from your audience, post presentation. 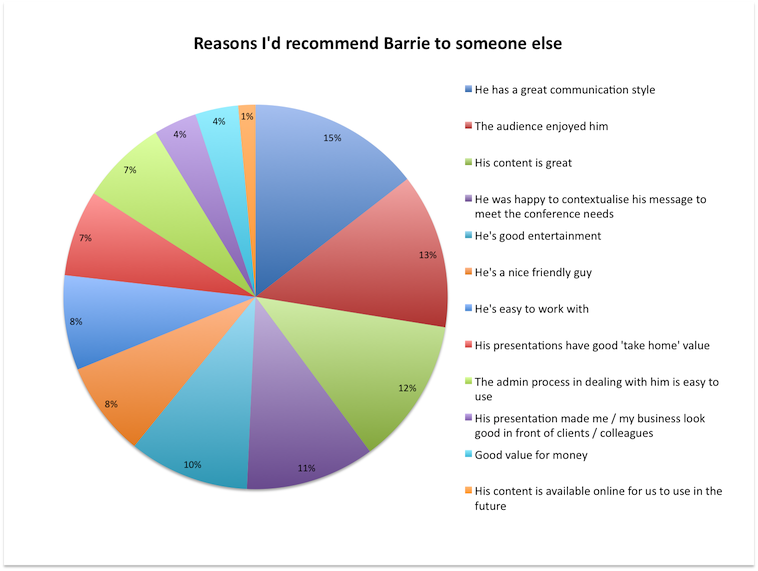 We asked approximately 50 clients Barrie had worked with to take a few minutes out of their day and let us know what they thought about Barrie as a Business Keynote Speaker? The questionnaire was answered anonymously. We do know that 60% of the people we asked responded. That’s not a bad response at all. Thank you to those who took the time to respond. See the results below. 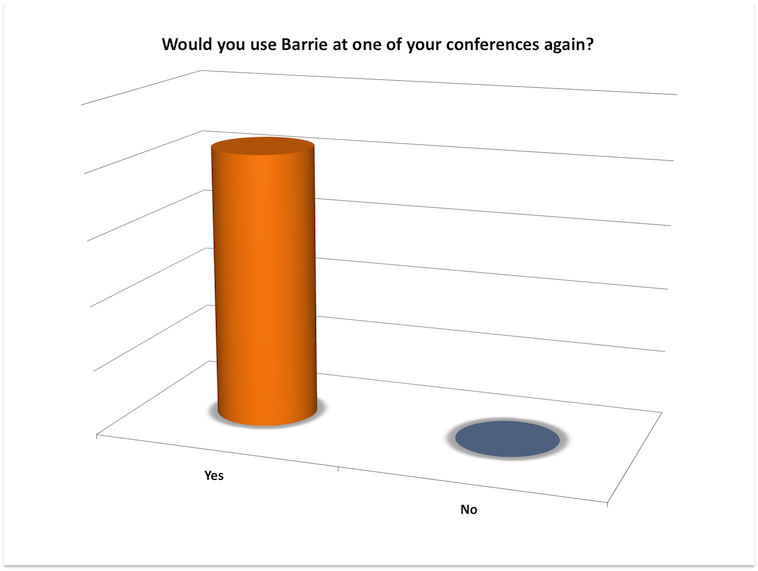 I just spent several days at a conference with Barrie. He caused me to re-think my business, how I run it, and who I want to do business with. He also showed me a way not only to embrace change, but to run head-on into it. I am no longer content with simply adjusting to disruption, I want to cause a little of it. A wonderful topical presentation with relevant learnings to latch on to. Highly recommended. Thoroughly enjoyed the session-I think he’s a really cool dude. So relevant-he spoke to young and old and he knows his stuff. I enjoyed his cool way in which he presented his material –very contemporary-so sobering. He touched on every possible topic from technology to people to customer service…in such a fun way. I left feeling so inspired and motivated to lift my own horizon. Barrie Bramley is a great speaker. 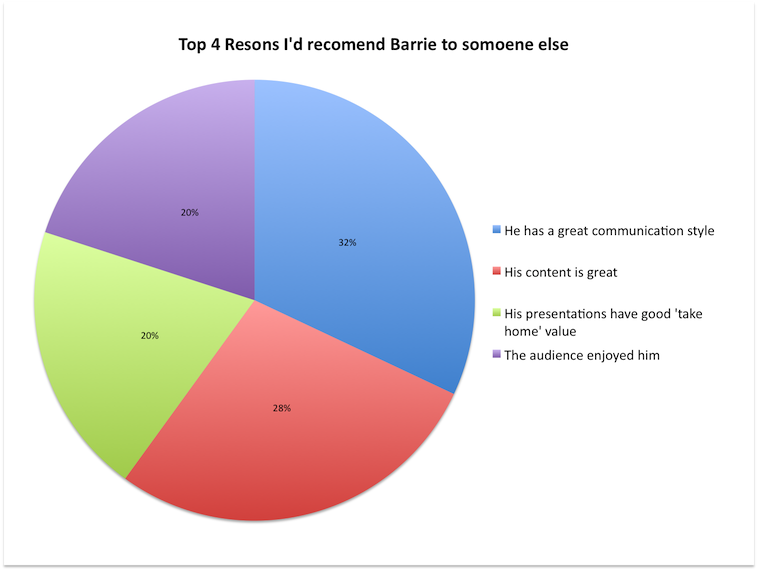 Not only is the information an eye-opener, but Barrie presents with great enthusiasm and a sense of humour that holds everyone in the audience enthralled. Barrie, thanks very much for the excellent sessions yesterday. All was very well received and useful. I’d like to thank you sincerely for a great presentation at our Convention. You certainly contributed enormously to the huge success of our best Convention ever!! Many thanks, I really appreciate it!! Thanks a million for the motivation we received on Thursday and Friday [Generations and Enneagram], I loved learning about The Millennium Generation the most. My daughter is turning 14 and there is so much we do not understand about each other. thanks…. Our office is going to be in hysterics trying to figure out everyone. I was blown away by your GENERATIONS presentation at Lever Pond’s feedback session last Thursday. I tried explaining it to others later but could not really do justice. Very good, informative, exciting presentation. Will help leaders manage, retain talent, solve problems etc. Very good for the first day after a long flight, not too heavy. Fun with some interesting insights. Very good use of different media in presentation. Excellent – made to review both relationships within the company and do markets and consumers. Illuminating presentation on generations and interesting insights into generation gaps. Excellent facilitation/presentation style and use of multimedia. Highly relevant material. An extremely enjoyable and relevant presentation. Certainly I will consider the “Generation Gap” and modify my actions/ behaviour in situations where generation gaps overlap. Excellent information provided by the presenters. The information can no doubt be applied in business strategy and in confronting daily issues. Very relevant to our dilemma of proper management of people.